Seitan Worshipper: "Losing Faith: How Scholarship Affects Scholars"
Thanks to Seitan Worshipper for this can of lighter fluid so desperately needed in our theological discourse! THANKS SW! 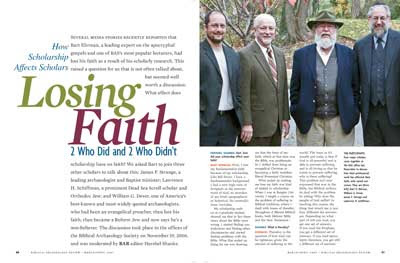 "Losing Faith: How Scholarship Affects Scholars"
James F. Strange, a leading archaeologist and Baptist minister; Lawrence H. Schiffman, a prominent Dead Sea Scroll scholar and Orthodox Jew; and William G. Dever, one of America’s best-known and most widely quoted archaeologists, who had been an evangelical preacher, then lost his faith, then became a Reform Jew and now says he’s a non-believer. The discussion took place in the offices of the Biblical Archaeology Society on November 19, 2006, and was moderated by BAR [Biblical Archaeology Review] editor Hershel Shanks. Hershel Shanks: Bart, how did your scholarship affect your faith? Bart Ehrman: First, I lost my fundamentalist faith because of my scholarship. Like Bill Dever, I have a fundamentalist background. I had a very high view of Scripture as the inerrant word of God, no mistakes of any kind—geographical or historical. No contradictions. Inviolate. Ehrman: Theodicy is the question of how God can be righteous, given the amount of suffering in the world. The issue as it’s usually put today is that if God is all-powerful and is able to prevent suffering, and is all-loving so that he wants to prevent suffering, why is there suffering? This problem isn’t ever expressed that way in the Bible, but Biblical authors do deal with the problem by asking: Why does the people of God suffer? In teaching this course, the thing that struck me is just how different the answers are. Depending on what part of Job you read, you get one set of answers. If you read the Prophets, you get a different set of answers. If you read apocalyptic literature, you get still a different set of answers. Shanks: Well, Larry, I take it that you, as an Orthodox Jew, don’t believe those historical claims about Jesus. Schiffman: No. One of the principles of the Jewish faith is not believing in Jesus. [Laughter] But, like Bart, I of course believe that he lived, preached and was crucified by the Romans. From a Jewish point of view, these kinds of problems aren’t problems. First of all, the Bible was never taken literally in Judaism. It doesn’t mean that it’s not historical, but it is not taken literally in the Protestant sense. It’s not an issue in Judaism. Admittedly there is a literalist strain in a minority of medieval Jewish thinkers and a minority—maybe a growing minority—in modern Judaism, but it’s not classical Judaism. The Talmud doesn’t take the Bible literally in the Protestant sense. Jim’s approach of taking a kind of experiential approach to the whole thing is one that is much more primary in Judaism. Seitan Worshiper here: This actually resonated for me, as a believer, because I struggle with doubt on a regular basis, as well as the whole notion of "Where is G-d when innocents suffer?" OTOH, I *do* believe in a Higher Power/Lifeforce/Creative Energy -- NOT a "Bearded Guy in the Sky". I look around me and see the wonders of creation and can believe that Someone/Something made it all. Having more questions than answers doesn't diminish the belief for me, nor do I find a conflict between Science/Reason and [my] belief. Also, I agree with Mr. Schiffman regarding the notion of Judaism as a set of rules that -- when applied conscientiously --enables one to live a decent life, and make the world around us a little better.